In the search for partners, it can sometimes seem easier to find a friend with benefits or a casual hookup than to find an honest-to-goodness, real-life girlfriend. Many guys feel it’s daunting enough to just go out and meet people and finding a girlfriend can seem light years away. But, honestly, when done right, it’s usually easier to find someone who is looking for something serious than something casual. However, you need to look in the right places and be the right kind of guy. Here are six tips to help you find a girlfriend — plus four pieces of advice for winning over girlfriend-worthy women the right way. To win an amazing woman over, you’ve got to go where the women are. 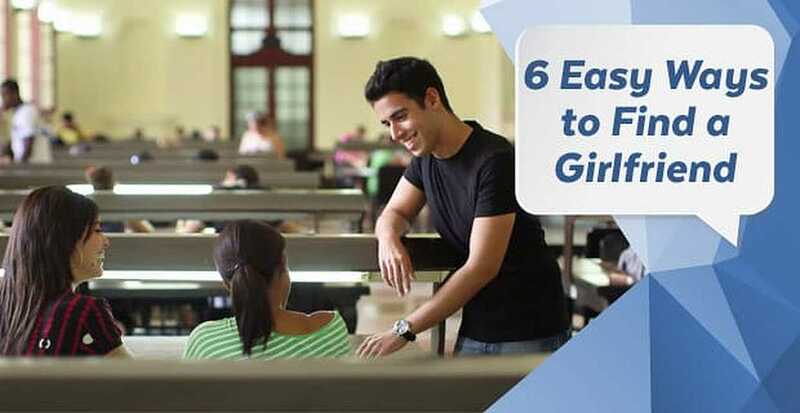 Below are the top six resources you should be using, places you should be going, and activities you should be doing if you really, really want to meet someone who could eventually turn into a girlfriend. The first way to start increasing your chances without having to invest a lot of time is to go online. Gone is the taboo of meeting someone through the internet. Around 30% of matches these days start online, but not all dating sites and apps are created equal. If you’re truly looking for a girlfriend, Tinder and Bumble may not be the best places to spend your time. Think of it as a bar. Yes, you might meet someone good at penny beer night, but it’ll be much easier to find a worthy match at a more upscale place. If you’re on a more serious and paid site, like Match, you’re immediately dealing only with the people who have invested some money and are serious about finding someone. And they also know you’re more serious about finding someone. Match was founded in 1995, which makes it the first dating site to ever exist. Since then, it’s facilitated the most romantic connections of any dating site. With more than 30 million members, and counting, Match will probably never run out of women who are girlfriend potential. Not only is Elite Singles a go-to dating site for the relationship-minded, it’s also a go-to dating site for those who value education — as more than 80% of members have earned at least a bachelor’s degree. eHarmony is responsible for about 4% of marriages in the US, and few dating sites can beat those odds. Plus, if you want a dating site that’ll do all the work for you, eHarmony should be in your crosshairs. Meetup.com is a great way to meet other people. Find something you enjoy doing, and look for a meetup in your area around that interest. There are meetups for almost everything: hiking, home brewing, sports, etc. You’re immediately joining a group in which you all share a love of something. When you do something you enjoy, your body language opens up, and you become more vibrant, excited, and energized. Most places have different types of easy and fun sports leagues open to the public. If Zog isn’t in your city, there are usually kickball teams, softball games, or other types of sports leagues, including co-ed leagues and leagues that don’t take themselves too seriously. If you’re into sports and want to meet a girl who shares the same passion, join a co-ed sports league in your city. It could be for volleyball, basketball, or even bowling. The point is to have fun and meet people. Not only is it a great way to meet and get to know people on your team, but you get to meet all the other teams as well. I played on a pool league for 10 years, and almost 50% of the players were female. It gets you out, introduces you to people, and lets you have some fun. Never underestimate the power of friends and family. It has the added effect of knowing that someone has vetted you and found you to be worthy of spending time with. Put your pride on the shelf, reach out to your friend group or your extended family, and let them know you’re seriously in the market for a girlfriend. If people know you’re looking for your love match, and not just looking for a FWB relationship, they’ll be more ready to help you out. Communities everywhere have so many needs and never enough people to help get things done, which opens up volunteer opportunities wherever you live. Most big cities, for example, will have soup kitchens or shelters that depend heavily on volunteer help. Personally, I enjoy Habitat for Humanity as I love to build stuff. There are bake sales, cleanup days, cancer walks, and all sorts of other events that would be happy to have your help. Volunteering is a fantastic way to meet fellow philanthropic people and do something nice for your community. Try Habitat for Humanity or your local animal shelter. Not only will you have the opportunity to meet others, but you’ll already be showcasing the fact that you’re generous of spirit and want to help those less fortunate than yourself. That’s always an attribute that immediately turns you into boyfriend material. Go to business networking events. No matter the industry you’re in, others in your profession are likely meeting regularly in your area — so find them. Whether it’s networking for bartenders, financial professionals, or just general networking, these events offer somewhere to mingle and talk business. And, yes, business is done and discussed, but, as the night goes on, it becomes more jovial and personal. It also shows any potential match there that you’re ambitious and take your job, whatever it is, seriously. Now that you know where to meet women who could make for good girlfriends, it’s time to talk about the correct ways to win them over. No games, pick-up lines, or crap like that! Don’t be this guy. Being nice is not transactional where the nicer you are, the luckier you hope to get. Be nice for the sake of being nice. Be careful of what I call the dreaded one-itis. One-itis is when you have one potential girl who you’re looking to date or get more serious with, and you end up spending all your mental bandwidth on her. You always want to be around her. When you’re not around her, you’re thinking about her or texting her. While, yes, it’s great to get a little obsessed with a new love, one-itis is putting every egg you have in her proverbial basket. She can sense it, and it can come across as needy, desperate, or downright creepy. You need to have other things to spend your mental bandwidth on. Have some activities you do on your own or with your friend group. She isn’t responsible for your happiness. You can’t put all your expectations on her. It’s exhausting! If you want a girlfriend, treat your dates like you would a girlfriend. Take them out on *gasp* actual dates. Don’t bring them to group hangouts, and don’t say you’ll “see them at the party.” Instead, take her somewhere one on one so the two of you can spend some intimate time getting to know each other. Make sure the girl you like knows you like her and are interested in a relationship by taking her on actual dates, not hangouts or anything else. Choose an activity date, a learning date, a food date, or a drinks date, but make it a date. Make sure she knows you’re taking her on a date and that you, yes, want to date her. So many people are in some form of emotional limbo, not knowing what you want or where you want it to go. If you want a girlfriend, be honest about wanting one. Don’t say “I’m not really looking for a commitment right now” just because you think it makes you look in demand or cool. Take a chance and tell the truth. I mean, don’t whine and pout about how everyone else has one and you don’t, but don’t disguise the fact that you’re looking for someone serious to spend time with. Most Girls Are Looking for a Relationship-Minded Guy Like You! Most girls are dreaming about a guy who’s looking for something serious and isn’t just DTF. Every day, my female friends complain about fuckboys, players, being ghosted, breadcrumbed, or whatever new thing that douchebags do to string girls along. Being honest and open about wanting to find someone serious is a fantastic quality. However, if you change nothing, nothing will change, so get out there, make a few tweaks, and good hunting!